Winter weather calls for preparation. Make sure your home and vehicles are ready when the cold weather arrives. Winter Storm Warning: Take action: the storm is in or entering the area. Blizzard Warning: Seek refuge immediately! Snow and strong winds, near-zero visibility, deep snowdrifts, and life-threatening wind chill. Winter driving is hazardous — Plan ahead for dangerous winter travel! Avoid driving on ice-covered roads, overpasses and bridges if possible. 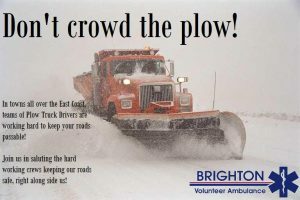 Plow truck drivers work hard to keep our roads safe and passable. Give them plenty of room!